Amédée Salomon de La Chapelle, “Joseph Chinard, sculpteur. Sa vie et son œuvre,” Revue du Lyonnais, 1896, vol. XXII, pp. 77-98, 209-218, 272-291, 337-357, 412-442; 1897, vol. XXIII, pp. 37-52, 142-57. Paul Vitry, Expositions d’œuvres du sculpteur Chinard de Lyon (1756-1813) au Pavillon de Marsan (Palais du Louvre) (exh. cat, Paris, nob. 1909-janv. 1910), Paris, 1910. Stanislas Lami, Dictionnaire des sculpteurs de l’école française, vol. I, 1910-1911, pp. 194-218. Catalogue des sculptures par Joseph Chinard, de Lyon formant la collection de M. le Comte de Penha-Longa (vente Paris, Galerie Georges Petit, 2 décembre 1911). Madeleine Rocher-Jauneau, L’Œuvre de Joseph Chinard : 1755-1813 (exh. cat. Lyon, Musée des beaux-arts de Lyon, 1978), Lyon, 1978. Isabelle Leroy-Jay-Lemaistre, “Joseph Chinard”, in Les Muses de Messidor. 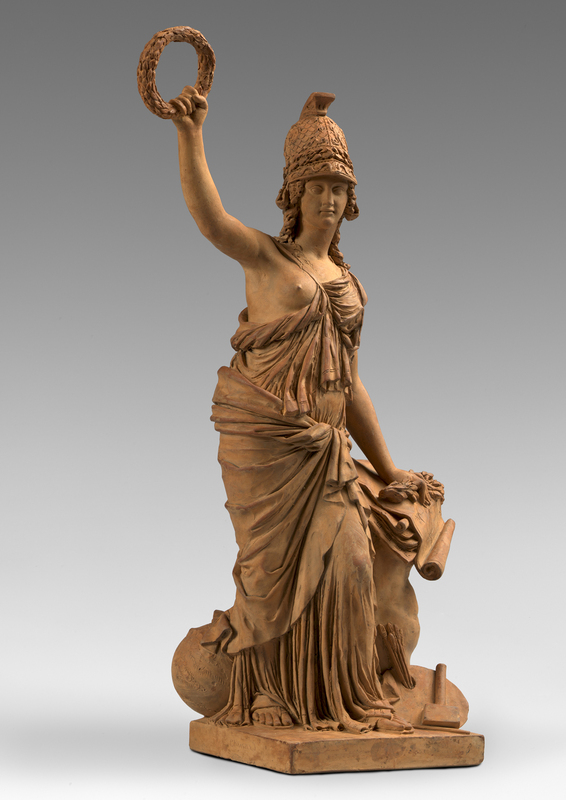 Peintres et sculpteurs Lyonnais de la Révolution à l’Empire (exh. cat. Lyon, musée des beaux-arts, 1989-1990), Lyon, 1989, pp. 72-89. Frédérique Brinkerink, ‘La carrière de Joseph Chinard (1756-1813). Prémices et stratégies’ in Christophe Henry and Daniel Rabreau (ed. ), Le public et la politique des arts au siècle des Lumières. Célébration du 250e anniversaire du premier Salon de Diderot, Paris, 2011, pp. 281-292. Alexandre Maral, ‘Bicentenaire de la mort de Chinard, 1813-2013. Chastel et Chinard, Rome, 1792. Sculpture et Inquisition’, in Les Cahiers d’Histoire de l’Art, no. 11, 2013, pp. 79-90. Philippe Bordes, ‘L’invention d’une iconographie révolutionnaire : Joseph Chinard (1756-1813)’, in Studi Neoclassici. Rivista internazionale, no. 4, 2016, pp. 41-50. 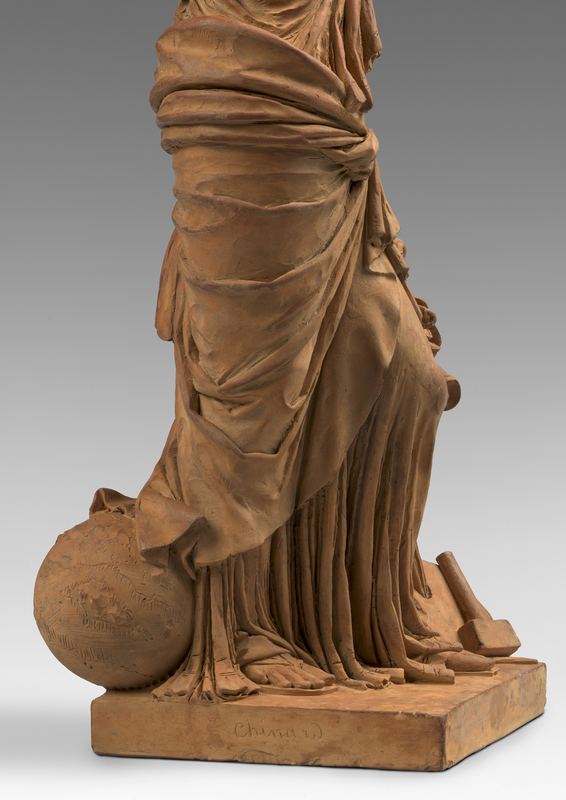 This terracotta statuette depicts Minerva protecting the Arts and Sciences. The goddess, sponsor of the Arts, dressed in a beautifully modelled classical drapery and wearing a decorated helmet, raises a laurel crown in her right hand. Her left hand, holding an olive branch, is resting in a gesture of protection on the symbols of the arts and science: a geometry drawing, a music sheet, a palette with brushes, the Belvedere torso with a chisel and a hammer as well as a globe. The exceptional quality of the present terracotta, the invention of Minerva’s striking pose and her great dignity, all point towards an attribution to Joseph Chinard. Because of its relatively sketchy and spontaneous aspect, less meticulously modelled than his known finished works, this statuette could have been a preparatory model for an unrealised sculpture, intended to be produced in marble or maybe in clay. The statuette’s inception can be related to Chinard’s admission, in 1800, to the Lyon Académie des Sciences, Belles-Lettres et Arts, as one of the first members after the Academy’s re-establishment as the Athénée. During the first session, on 8 August 1800, the sculptor offered a bust in plaster representing Minerva, now lost. Our model may have been one of Chinard’s first thoughts for this tribute. Sculptures executed by Chinard in Lyon around 1790 may be stylistically compared to the present piece. For example, the virtuoso treatment of the drapery, but also of the hair and both laurel and olive leaves compare well with the model for L’Amour de la Patrie, an allegorical group realized in 1790-91 (Lyon, Musée des Beaux Arts, fig. 1). 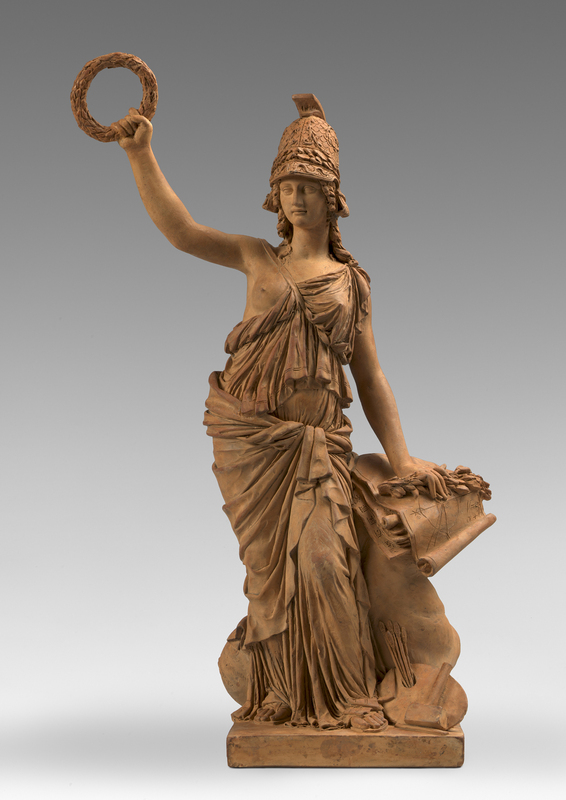 Moreover, the facial features of Minerva display striking similarities to those of La République (1794, Musée du Louvre) (fig. 2). Note the geometrical shape of the eyes and their arch, the classical nose and mouth. Note also the modelling of the drapery, most notably in the lower section, above the figure’s feet. 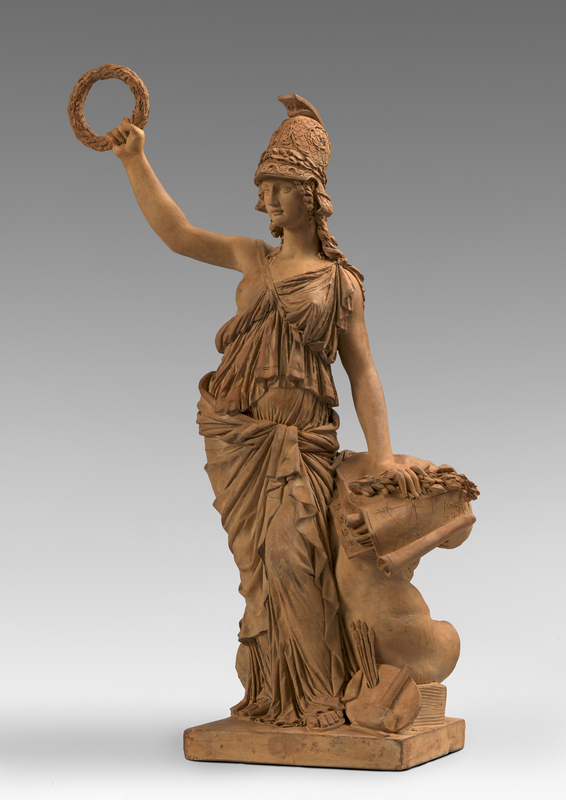 A third statuette to consider is Innocence taking refuge in Justice (fig. 3), modelled in 1793 during Chinard’s wrong imprisonment in Lyon. Once more, there are striking correspondences in the composition and handling of certain details. The majestic, almost austere, goddess with her beautiful and neutral face is typical of Chinard’s neoclassic stance. For all the strong similarities between the present piece and the above-mentioned works by Chinard, an attribution must remain tentative. In fact, a number of artists of which we know little about, and who were heavily influenced by Chinard, gravitated around the Salon of those years. Joseph Chinard was the most important French sculptor working outside Paris at the time of the French Revolution and the first Empire. He was imprisoned twice: first in Rome, where his works were seen as religious attack, then in Lyon, were – ironically – he was perceived as counter-revolutionary. He nonetheless went on to a great career, producing refined bust portraits, medallions and allegorical sculptures as well as designing public monuments. Born in 1755 into a family of master silk weavers and merchants, Chinard first studied under the painter Donat Nonotte (1708-1785) at the École Royale de Dessin and the sculptor Barthélemy Blaise (1738-1819). In 1784, he travelled for the first time to Rome, where he stayed for three years, making copies after the antique and portraits for private patrons. His reputation grew when he won the first prize in the Concorso Balestra of the Accademia di San Luca with a terracotta sculpture representing Perseus and Andromeda. After a second sojourn in Rome in 1791-92, where he was imprisoned for two months in the Castel Sant’Angelo for religious infamy, Chinard pursued his career in Lyon, serving the République, the Directoire, and the Empire as organizer of civic festivals and designer of patriotic monuments. Most of his many public works survive only in the form of models (primarily in the Musée des Beaux-Arts, Lyon). A talented portrait sculptor, he was greatly esteemed by Napoleon’s family, for whom he created a number of busts in terracotta, plaster and marble. He showed a particular gift for portraits of women, such as the Bust of Empress Joséphine (terracotta version in The Cleveland Museum of Art) or the Bust of Juliette Récamier, a figure celebrated for her beauty (terracotta version in Los Angeles, The J. Paul Getty Museum). Other artists active at the time have been researched as possible authors of the present piece, but the comparisons have proved unconvincing. For example, although a few terracotte by Jean-François Lorta (1752-1837) do survive, the overall treatment does not correspond. Jacques-Philippe Lesueur (1757-1830) was certainly familiar with the iconography, but his figures do not share a comparable countenance with the Minerva. Finally, works by François-Nicolas Delaistre (1746-1832) display a not entirely dissimilar treatment of drapery, but do not share a similar vocabulary. 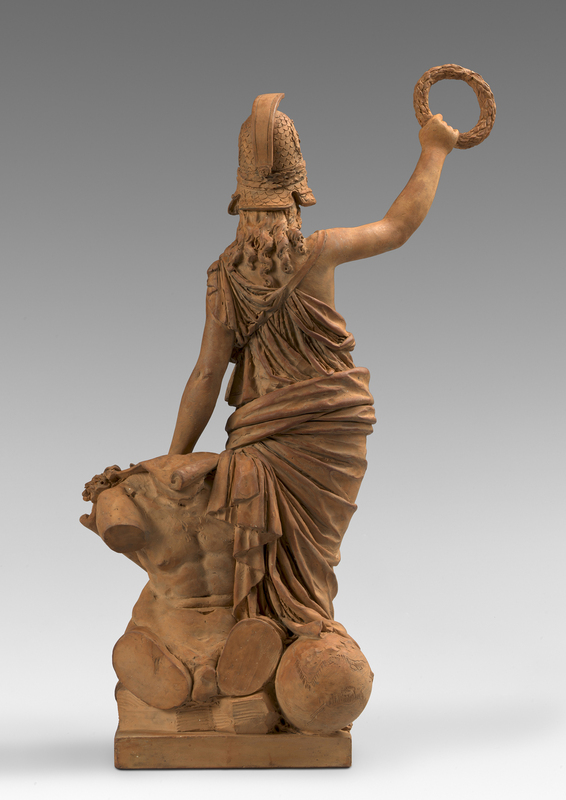 It remains to point out that, for all the convincing resemblances between the Minerva and other works in Chinard’s oeuvre, a number of artists are documented in the Salons of the time about whom we still do not know enough to entirely rule out a potential, alternative authorship for the offered terracotta. A. Salomon de La Chapelle, op. cit. 1896, p. 351. Cfr. Ph. Bordes, op. cit., 2016, p. 43-44. Sold in Paris, Drouot, Beaussant Lefèvre , 13 June 2012, lot 121. Two versions of the sculpture exist, one in clay which current location is unknown and one in marble, Los Angeles, The J. Paul Getty Museum, 94.SA.2.